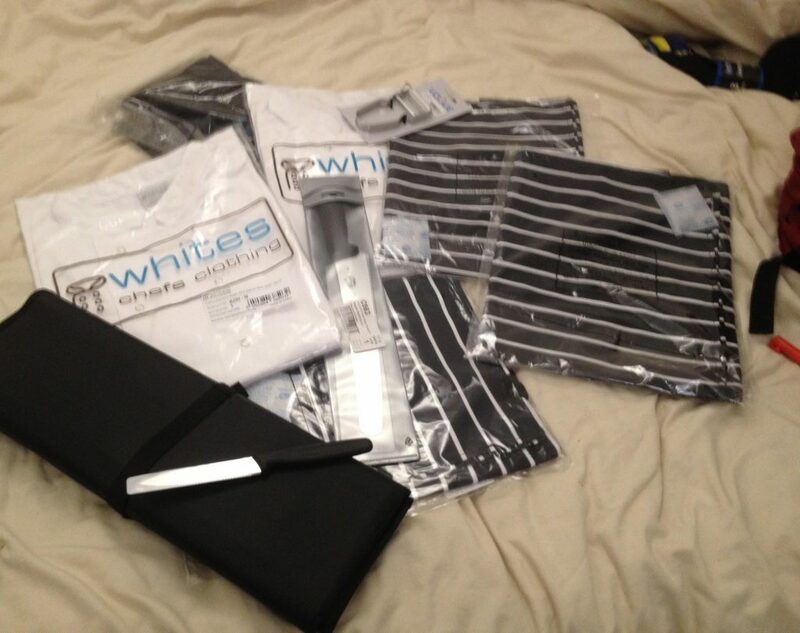 Chef’s gear = sorted! Plus new glasses and some casual clothes. What a difference 13 days and the overwhelming kindness of strangers can make! Just two Wednesdays ago I met homeless poet Anthony on the freezing cold streets of Bristol – read the full story here – and now, after an incredible 7 days of kind donations from the people of the internet, I’m delighted to tell you he’s moving into a room in a shared house this weekend and has a trial shift for a great job lined up too. It’s like something from the movies, isn’t it! The GoFundMe campaign is now closed because Anthony feels he has everything he needs to be able to get back on his feet, but if you’d like to read any of the updates click here. If you’d like to donate money to help end homelessness for others please search for charities in your area, or better still why not strike up a conversation with the next street sleeper you see and ask them how you can help today? Could you get them a coffee, a sandwich, money for a bed for the night? If that’s too scary, work up to it by making eye contact and smiling at someone – it can make such a difference. We’re all humans, and deserve to be seen and acknowledged whatever our circumstances. I was nervous sitting down to talk to Anthony – I thought he’d think I was weird and nosey! – but I’m so pleased I did. Thank you so much to everyone who contributed to the fund. People were super generous and it was amazing to see the bulk of the funds raised within 24 hours. It can be a very harsh world out there, but it doesn’t have to be – this is proof. Now, this experience has been a great success so far, but clearly it oversimplifies a very thorny issue. There are a myriad of reasons that people become homeless, and many people require support from knowledgeable, trained individuals. There are people working tirelessly to offer services for people on the streets in Bristol and beyond, and I fully respect their wisdom and experience. I don’t know better than any of them. I just met someone, bonded with them and felt I had a way to help them that could work for their specific situation. Throughout our early conversations I kept asking Anthony what things he needed to be able to stop sleeping in doorways, and for him they were straightforward: a smartphone and money for work clothes so he could go and get a job and money to pay for a place to stay so he wasn’t sleeping outside, and so he could be clean and presentable for said job. He was clearly employable, with skills and experience that would be valuable to others – it frustrated me so deeply that there was just this relatively small financial barrier in the way that I paid for a private hostel room for a week so he could at least be safe and clean and start searching for work. Then the idea of a crowdfunder popped into my head, which I agonised over for a few days. I had all sorts of worries about stepping in to help like this – knowing how wonderfully supportive my mailing list subscribers and online friends/fans have been of my musical project over the last decade meant I did have a good idea this would be successful, and that only made me worry more. What if handing over this sort of money to someone was terribly irresponsible? What if fixing these problems led to more further down the line? What if I was wrong, and I ended up abusing the trust of these wonderful people? I spent a day or two paralysed with indecision, trying to work out what to do. In the end it was seeing Anthony get brighter and bouncier after a series of good nights’ sleep in a proper bed and having conversations where he talked with great enthusiasm about clever ways to help other homeless people in the future that convinced me I just had to take action. Paying the deposit for his new houseshare yesterday was a great moment. I keep saying to people that it’s lucky things are turning out so well, but I really don’t believe in luck. After our chance encounter, we formed a connection quickly but then spent hours talking through things. Even if we hadn’t, Malcolm Gladwell wrote about the power of first impressions – apparently we make decisions “instantaneously or in two seconds”. That sounds about right! I believe Anthony’s first words to me after I said “hello” were “you’ve got a beautiful smile”. Well Anthony, my smile has got bigger thanks to you. Here are some words from the man himself – and you can now follow his Facebook Page! Ok well here’s a few..
Said some poetry.. People liked it. Wrote about many I met. They could never understand at times why I was so positive. Well I knew it was only temporary. But it would’ve taken me months out there in the cold. It was harsh, cold and lonely. Given me the best bunk up in life.. Like ever!! Anyway thank you I’m off to curl up in the warm .. Cuppa and some boxing .. Or maybe a documentary..
With loads of others volunteering time or skill..